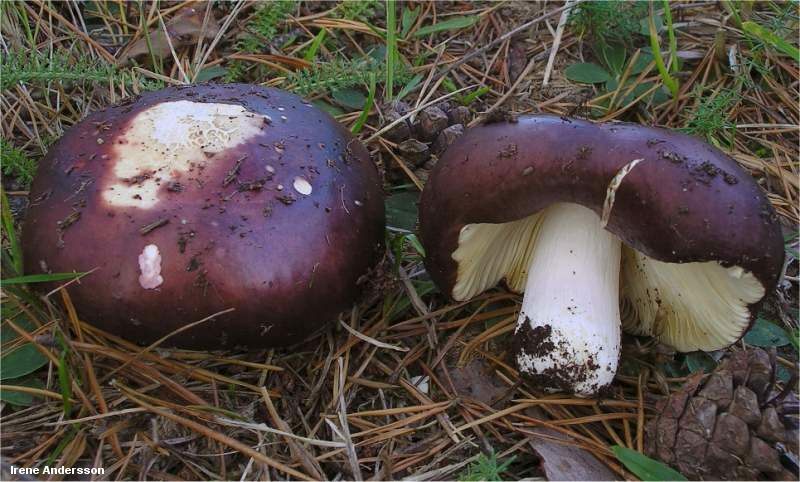 Often called the "shrimp russulas," these Russula species have a characteristic odor, strongly reminiscent of shrimp or fish. If my experience is indicative, the odor smells faintly like fish at first, and becomes more and more "shrimpish" with maturity. Keep a specimen in the house for a few days (or dry it for later study), and you'd swear you were on the shrimp boat set of Forest Gump. Aside from the smell, other distinguishing features for the shrimp russulas include: yellow-brown to brown staining on the stem, flesh, and gills; an off-white to yellow spore print; and a green reaction to iron salts on the stem surface and flesh. There are any number of shrimp russulas in North America, and they have not been adequately studied. Cap colors range from red, pink and purple to yellow, brown, and olive. 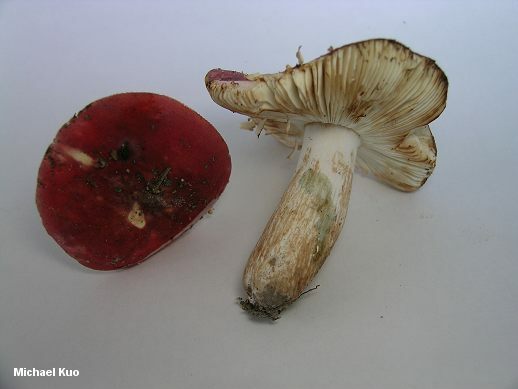 The name "Russula xerampelina" is often used in North American field guides, but it belongs to a purplish red, European species that is mycorrhizal with (European) conifers. In fact most of the commonly used names for these mushrooms are European; see the comments below for more information. Note: This description applies to the shrimp russulas as a group. Ecology: Mycorrhizal with conifers or hardwoods; early summer through late fall in temperate regions, but also over winter in warmer climates; widely distributed in North America. Cap: 4-30 cm; convex, becoming broadly convex, flat, or shallowly depressed; sticky when fresh (but a few species are dry-capped); fairly smooth or, in some species, almost velvety, especially when young; the margin usually not lined, or lined only faintly; colors ranging from reds and purples to browns and olives (but one species is yellow, and at least one is orangish), but often demonstrating considerable variability even within a single "species" or collection. Gills: Attached to the stem or beginning to run down it, but often becoming separated from it with age; crowded, close, or nearly distant; white to creamy at first, but becoming creamy to yellowish or orangish yellow by maturity; often bruising and discoloring yellowish brown to brown. Stem: 3-12 cm long; 1-4 cm thick; more or less equal; dry; fairly smooth; white, or flushed with reddish to purplish shades; bruising slowly yellowish, then brown. Flesh: White; discoloring slowly yellowish brown to brownish or brown when sliced. Chemical Reactions: Stem surface and flesh green to gray-green or olive with iron salts. Spore Print: Creamy, yellowish, or orangish yellow. Microscopic Features: Spores for most species are broadly elliptical, featuring fairly isolated warts that extend .5-1.5 µ high, and absent to scattered connectors. Pileocystidia present. REFERENCES: (Schaeffer, 1770) Fries, 1838. (Peck, 1906; Burlingham, 1915; Beardslee, 1918; Kauffman, 1918; Smith, 1949; Hesler, 1960; Smith, Smith & Weber, 1979; Arora, 1986; Kibby & Fatto, 1990; Phillips, 1991/2005; Lincoff, 1992; Evenson, 1997; Thiers, 1997a; Thiers, 1997b; Barron, 1999; Adamcik, 2002; McNeil, 2006; Miller & Miller, 2006; Kuo, 2007; Buyck et al., 2008.) Herb. Kuo 08160304, 05260402, 07270602, 07140706, 08180702. Russula xerampelina, with a red to purplish red cap and a conspicuously pinkish stem; associated with conifers (especially pines). Russula favrei (sporting the number 4 and refusing to ever retire? 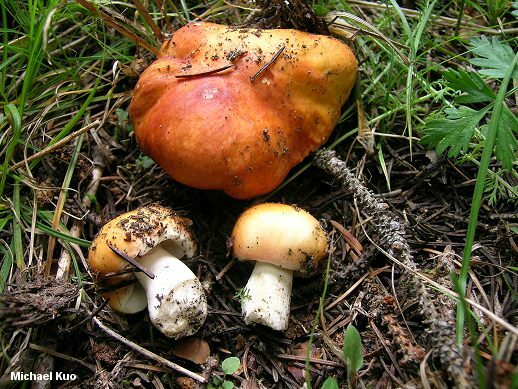 ), with a brown to reddish brown cap; associated with conifers at high elevations. Russula elaeodes, with a greenish to olive cap; associated with various hardwoods. Russula barlae, with an orange to coppery orange cap; associated with oaks. 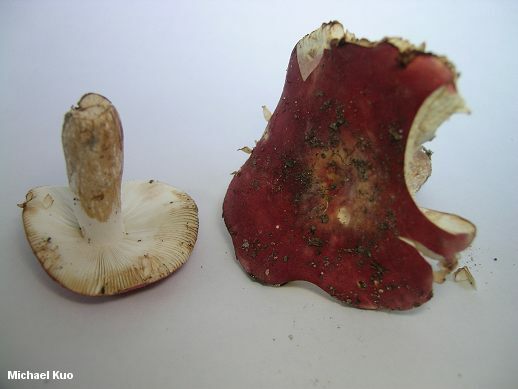 Russula faginea, with a purple-brown to brown or reddish cap; associated with beech. Russula graveolens, with a brown to purple brown cap; associated with oaks, birches, and other hardwoods. 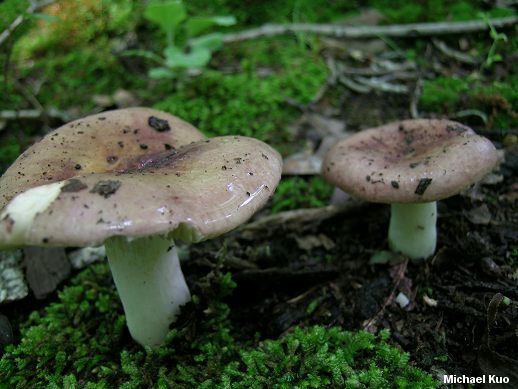 Russula squalida, with a reddish purple to pale and mottled olive to tan cap; named from New York material and later reported in Michigan and elsewhere in eastern North America; probably associated with oaks. Russula fucosa, with a red to reddish orange cap; named from Vermont material, reported as common in New Jersey, and possibly distributed throughout eastern North America; associated with beech and/or spruce. Russula grundii, with a yellow cap; named from a single California collection and apparently not collected since; associated with oak. Russula texensis, with a purplish red cap; named from a single Texas collection and apparently extremely rare; found under oaks, beech, and loblolly pine. None of my collections matches any of these North American or European shrimp russulas very well, so I look forward to a contemporary study of this group on our continent.